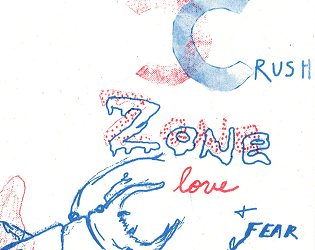 Crush Zone is a reflection of the complex feelings of having a crush on someone. It is not meant as diagnostic criteria or a bottom line. Instead, it is more of a provocation, and an invitation to map out your own Crush Zone(s). It was made during a one-day riso zine workshop at the DCA on March 12, 2017. Inspired by @v21's crush themed shitposting and everyone who I've ever had a crush on.